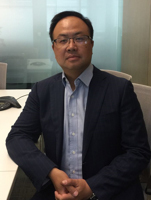 Mr. Lu Zhendong, deputy head of shipping finance department in Bank of Communications Financial Leasing Co., Ltd. He has long been engaged in international and domestic shipping financial leasing work. This professional team he works with has 380+ vessels with the balance of more than 63 billion yuan. This team has developed long and stable business relationships with Maersk, MSC, CMA, TEEKAY, Trafigura Group, Sinochem, Stena and so on, which makes it has established a leading market position domestic and worldwide.